One of the many challenges that small business owners face is having to offer net-30 to net-60 payment terms to clients. While offering net-30 terms can help you increase sales, it also exposes your business to credit risk. Basically, your company could run into cash flow problems if your client pays late, or worse, doesn’t pay you at all. You can minimize (but not eliminate) this risk by running a commercial credit report on your client. The report gives you an idea of the client’s payment habits. Obviously, if a client is not a good payer, you should ask for a prepayment and not sell on credit terms. While commercial credit reports have gotten easier to understand throughout the years, they do require some know-how. In this article, I provide an easy-to-understand tutorial so that you can begin to do your own analysis. If you are new at this or are dealing with large sums of money, consider teaming up with a CPA or finance professional. For this tutorial, I decided to work with Ansonia’s commercial credit reports. They have been around for a few years and offer a very nice product. I am also friends with Kathy Dasal, the CEO of this startup. She was kind enough to provide me with unlimited access, sample reports, and answers to all my questions. By the way, here is some information about their credit reports. Although my example is specific to Ansonia’s credit reports, most of what you will learn today also applies to other credit bureaus such as D&B, Cortera, or Experian. In general, commercial credit report costs can range from $20 to hundreds of dollars. They can be expensive, especially if you are making small commercial sales or if your margins are low. One thing I like about Ansonia’s reports is that they are relatively inexpensive. Most reports cost less than $10 – an excellent price point for small business owners. Here is some pricing information for Experian and for D&B to give you an idea of cost. Before starting, get your client’s corporate information – company name, address, and phone number. If your client is a subsidiary office of a larger business, get the name, address, and phone number of the headquarter offices as well. As you can see, only the first listed company matches the description. The last column, labeled “Cos”, indicates the number of reporting companies – that is, the number of vendors sharing information with Ansonia. In this case, 47 companies are reporting, an indication of a report with solid data. In my opinion, reports with only a few reporting companies (two or three) should be used carefully since the information is not sufficient to make a sound credit determination. I prefer to see at least five or six reporting companies for a small business. Obviously, large companies should have many reporting companies. The first thing to look at is the credit summary, which is shown at the top of the report. Most credit reports have a scoring mechanism which can be hard to understand (e.g., D & B’s paydex tables), especially for beginners. Ansonia uses a very simple structure that is easy to understand. They provide the total average outstanding receivables and the average time it takes to get paid. In the case of Sample Reporting, Inc., the outstanding is $3,075,000, which paid in 36 days. By the way, just like 3K means $3,000, 3075K means $3,075,000. The “K” means multiply by 1000. Then look at the Risk Score – a proprietary measure of risk. Every credit bureau has its own scoring method. In this case, Sample Reporting Inc. has a score of 90, which is quite good. Next, look at the high balance to learn the size of the largest line of credit from a single vendor. In the case of this company, it’s $1,913,847. You can see that there is one alert available for a small unpaid debt. These alerts can be common with large companies and do not necessarily indicate problems. Ten alerts, on the other hand, would be a different story. At first glace, this information looks great. However, smart credit managers don’t rely solely on these three measures to make a credit decision. They look at the details. Now look at the long-term trends. These charts show you the average balance and days to pay. Disregard the last point in the chart; it is zero because there is no data for the month of 4/13, the month when the report was run. The “Balance” chart on the left shows that the average outstanding balance for the past couple of years ranges from a little under $2,000,000 to over $5,000,000. More importantly, the “Days To Pay” chart on the right shows that the client has been a steady payer for many years. This trend is good. In the world of credit reports, past performance is a great predictor of future performance. However, like any prediction, it does not always turn out as one expects. The next step is to dive into the actual credit details. The report provides you with a summary by month, which you can expand to get payment details by industry. 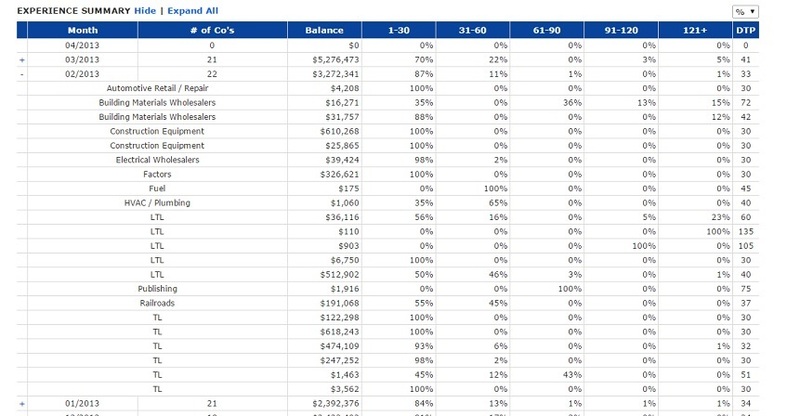 The report shows the balances and the percentages according to payment time period. These summaries are important because they let you know if your prospective client favors some industries over others. This information can be an important factor in your credit decision. Let me give you a hypothetical example. Let’s say that your client manufactures widgets and you want to sell them office supplies. From their perspective, paying their suppliers of widget components on time may be very important. On the other hand, paying their other suppliers on time may be less important. There are plenty of office supply vendors out there. Their credit report may show that, on average, they have great credit. But once you look into detailed data, you may find that office supply vendors are paid after 60 to 90 days while everyone else is paid on net-30. This level of detail is not captured in the average or the credit ratings but is extremely important to vendors. Next, examine if the company has any bankruptcies, tax liens, or judgments. Ansonia charges a few extra dollars for this data because they have to get it from an outside vendor. Simply, do the other analysis first and, if it looks good, buy the tax lien, bankruptcy, and judgement data. As this report shows, this company has none. Now that you have all the data, you are ready to make a credit decision. In the case of Sample Reporting Inc., all the data looks good, so I would feel comfortable giving them credit terms. Now, how much credit is a matter of personal preference. In this example, you know that their total average credit is about $3,070,000. The highest line for a single vendor is $1,900,000. I’d be wary of offering more than 10% of total credit: $3,070,000 x 10% = $307,000. This percentage is my preference. You, as the business owner, need to make a choice with which you are comfortable. What level of risk are you willing to take? Low cash flow – a side-effect of offering net-30 terms? One thing to keep in mind is that offering payment terms to clients can affect your cash flow. You must be able to pay your business expenses while waiting 30, 60, or even 90 days to get paid. That can be difficult if you don’t have adequate reserves or if your company is growing. You can improve your cash flow by using a factoring financing program. Factoring provides you with financing for slow-paying invoices from creditworthy customers. Instead of waiting to get paid, you get immediate funding from the factor. The transaction settles once your customer pays its invoice in full. This solution can be a great option for small and growing companies. 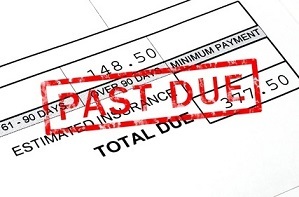 Since factors only buy creditworthy invoices, they usually have good credit departments. Many factors will help you evaluate the creditworthiness of your clients as part of their services. This guidance is important, as they can help ensure that you work only with creditworthy customers.